With this tab you can find words by reading like in paper dictionaries. The program displays the list of words in all attached dictionaries. Enter the reading of the word. The word will be highlighted in the list, word article will appear in the bottom window. With this tab you can find words by kanji. Press the tab and enter kanji text or copy-paste kanji text into the entry field. Instant full-text search. Type a word and the program will display a list of all dictionary articles and book phrases with this word. 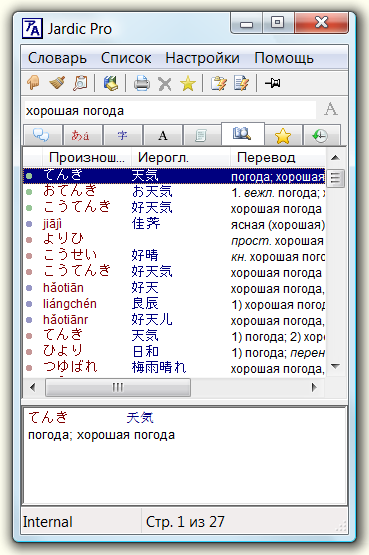 Jardic Pro can work with collections of parallel texts in Japanese, English, Russian and other languages. It also supports «Examples» dictionary that contains more than 150,000 sentences. This function allows to work with such data in a most effective way. You can quickly find a word in many translation samples. When this button is pressed Jardic Pro monitors cursor position and translates words under the cursor "on the fly" in Microsoft Word or Microsoft Internet Explorer. For texts written in kanji the program displays translation of separate words, word components and separate kanji's. With this function you can print selected word articles or write them into an RTF file. The file could be processed later with Word or WordPad. Right mouse button click activates a context menu. With this menu you can find words, print words, change program settings and run other commands. All user interface items of Jardic Pro such as menus, captions, messages, etc. could be displayed in Russian, Japanese or English. You can change user interface language at any time when working with the program. Open Microsoft Word document that contains Japanese text or put Japanese text into Microsoft Word by copy-pasting (e.g. from other document or from an internet browser). Start Jardic Pro and press button to activate monitor mode. With the button you can pin Jardic Pro window over other windows. You can find translations of words just by pointing them with a cursor, like it is shown on the right picture. When multiple dictionaries are opened and the word was found in more the one dictionary, the program displays translation of the word that was found in the first dictionary. To see translations from other dictionaries press "[+]" expander in the word line. Jardic Pro also finds translations of separate kanji's and word components of complex words. You can see translation of kanji's and word components after pressing "[+]" in the word line. You can create and print supplementary dictionary for translated text or for a language lesson. To do this highlight the words that should be included into the dictionary and put them into Selected list by pressing button. Switch to Selected list by pressing tab to view list content. To print a list of selected words in a form of a dictionary switch to the list of words and press button. The program will display a window with printer settings. Press "All articles" button. Then you can send your dictionary directly to printer or save it in RTF file to edit or print later with Microsoft Word or WordPad. Part of the printed page of the dictionary prepared in this way is shown on the right picture. You can print highlighted words from any list that Jardic Pro displays. To highlight more then one word hold down Ctrl or Shift key when clicking on word lines. Search for words and kanji in different dictionaries. You can search for words in internal dictionary and in external dictionaries, for example in popular EDICT. Jardic Lite supports equal functionality both for internal and external, Japanese-Russian and Japanese-English dictionaries. Internal Japanese-Russian dictionaries of Jardic Lite cover Level 3 of JLPT. Internal dictionary of words contains about 7,000 articles; internal dictionary of kanji contains 245 articles. Translate words under the cursor in Internet Explorer and Microsoft Word. Jardic Lite has the ability to translate words under the cursor without pre-selecting Japanese words. When different decisions are possible Jardic Lite shows the list of translations. Creation of external dictionaries of words and kanji. Jardic Lite contains powerful set of functions for developing Japanese dictionaries. You can create dictionary articles by direct typing, by copying lists of words through the clipboard, by dragging, etc. Dictionary articles can be edited with convenient dialog functions. You can quickly build specific Japanese dictionaries for your own purposes.